LitePoint has roiled out their IQgig-5G, the industry's first fully-integrated 5G millimeter wave test solution that enables 5G product developers to quickly validate their designs and accelerate getting their products to market. The IQgig-5G system covers both the popular 28 GHz and 39 GHz 5G millimeter wave bands and has multiple RF ports which make it easy to measure signals with both horizontal and vertical polarizations. The test system integrates both signal generation and analysis capability in an easy to program, 4U sized chassis. Laboratory grade RF performance is factory calibrated to each RF port. This level of integration allows precision measurement within minutes of setup, saving hours of engineering time. The IQgig-5G supports the pre-5G modulation standard today and is upgradeable to support the 3GPP NR standards as they are released. An over-the-air millimeter wave chamber is also available that allows full hemisphere coverage of antenna beam forming performance using a motorized gimbal system. Adam Smith of LitePoint revealed that there is intense pressure to develop and understand the performance of 5G millimeter wave products spanning from the semiconductors to end systems. 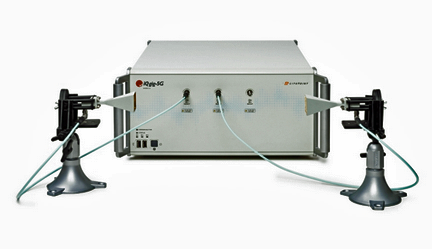 The IQgig-5G test solution dramatically simplifies making accurate RF measurements, both conducted and over-the-air. The IQgig-5G allows users to focus on the design, not the test system.